EVERYWHERE WE GO...PEOPLE WANNA KNOW...WHO WE ARE. What began as a simple online group created for Military Brats to reminisce and encourage one another has expanded into the ONLY MILITARY BRAT NON-PROFIT ORGANIZATION that also helps "aged out" Military Brats. We have a seven member 100% volunteer BRAT Board of Directors made up of Army, Air Force and Navy BRATS who provide the necessary oversight and accountability for the BRATS BLESSING BRATS FUND. These are busy BRATS who quietly serve behind the scenes, in their “free time,” without remuneration. Individually, we know that BRATS are independent and strong, but when BRATS get together...WE ARE ARE A TREMENDOUS FORCE AND WE ARE BRAT STRONG! Together by contributing to the BRATS BLESSING BRATS FUND we CAN help meet the real needs of our MILITARY BRAT brothers and sisters! FALL IN & PLUG IN, BRATS! Military Brats remember the days when living on Base/Post meant safety, stability and a strong, tight-knit community. The Base Chapel was at the center of so many Military Brat's lives. Not only did many different faith traditions share the same building, we shared the same life experiences that only Military Brats can understand. 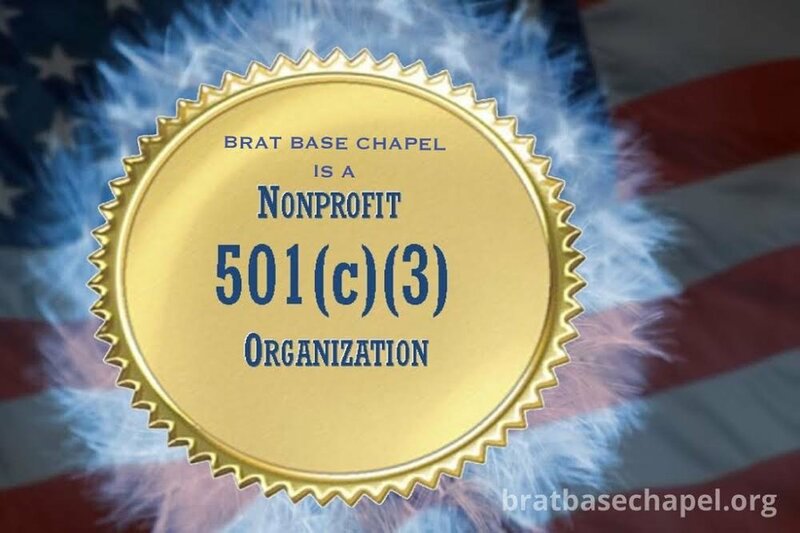 The BRAT BASE CHAPEL is a 501(C)(3) Non Profit Organization with the sole purpose of strengthening and improving the lives of all Military Brats. It's the desire of the BRAT BASE CHAPEL that you are strengthened in spirit, built up in your faith, lifted up in prayer, blessed by one another and that you find some very unique fellowship among Military Brats. The BRAT BASE CHAPEL is a place where we can love one another as Christ has loved us!